I Didn’t know that was Recyclable! Photograh by Mike & Marta Schroyer, Editor of Deep Creek Times, Online Magazine. 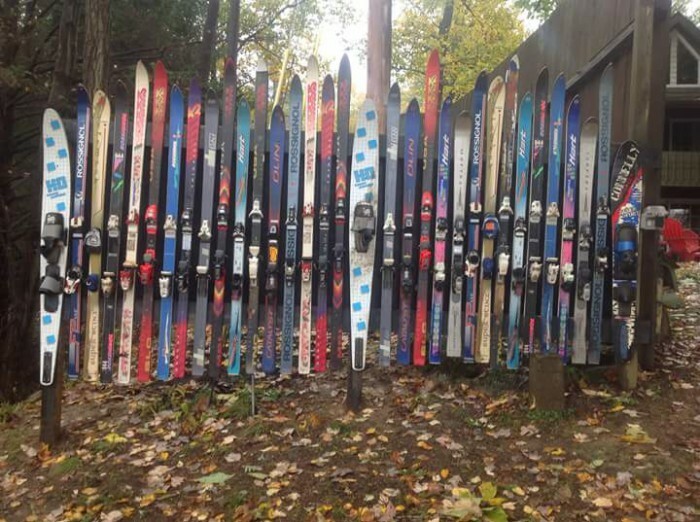 A creative use for skiis. Lovin this colorful fence!!! Thanks for sharing. 10/6/16 - MLS, Rest in Peace, my friend. A quick clean out of your arts and crafts drawer or your child’s old toy bin is likely to yield a box of crayons, which most us would toss out without a second thought. But believe it or not, there is a National Crayon Recycle Program operated by Crazy Crayons, LLC. The recycling program has diverted more than 47,000 pounds of crayons from landfills. Each day, more than 120,000 pounds of crayons are produced in the U.S. alone. With drop-off bins nationwide and a mail-back option, the program accepts unwanted and broken crayons for recycling into new crayons. Also, most schools and community organizations will accept unbroken crayons for use in their art programs. ReCORK America has partnered up with national retailers to establish wine cork collection locations nationwide. In addition, the organization partners with restaurants, businesses, resorts, wineries and wine retailers to collect their used corks from day-to-day business operations and recycle them into new materials. Recycled wine corks can be made into flooring tiles, building insulation, footwear, automotive gaskets, bulletin boards, packaging materials, soil conditioner and sports equipment. Natural corks, made from the bark of a cork tree, are ideal for recycling as they are renewable, natural, sustainable and energy-efficient. Synthetic corks made from petroleum-based products are not accepted for recycling through the program. According to ReCORK America, there are 13 billion natural cork wine stoppers sold in the world market each year, most of which end up in the landfill. It takes approximately 300,000 wine corks to yield a ton of cork for recycling into new product. More than 500 concerned citizens used hairmats to clean up the Cosco Busan Oil Spill on Ocean Beach in San Francisco. Yep, human hair! Not only can human hair be composted, but it can actually be recycled into dense mats for soaking up oil. Public charity, Matter Trust, began the Hair For Oil Spills Program in 2000 after Phil McCrory, a hair stylist from Alabama, watched news coverage of the 1989 Exxon Valdez oil spill and noticed the oil saturated fur on the Alaskan otters. After testing the amount of oil he could collect with hair clippings from his salon, McCrory invented the hairmat to help soak up oil from an estimated 706 million gallons of oil that enter our oceans each year. There are more than 370,000 hair salons in the U.S., and each collects about 1 pound of hair per day. That represents a tremendous amount of landfill matter from something we probably never even thought about! With help from Matter of Trust, thousands of volunteers are deployed after oil spills to clean up beaches using the hairmats. The charity even sponsors an Oily Hairmat Remediation study, detoxifying the oil mats through a thermophilic compost and vermiculture process. ‘Tis the season for holiday lights galore. And as Clark Griswold so famously discovered in Christmas Vacation, when one bulb goes out, the whole strand seems to go out as well. But is it time to throw that strand of holiday lights in the trash? One of the fastest growing holiday recycling programs involves strand lights, with municipal programs and national retailers like Home Depot signing on to offer consumer recycling. Making the switch from regular incandescent strand lights to LED lights? According to the U.S. Department of Energy, that is a wise decision, as ten incandescent strands running all night produces 300 pounds of CO2 versus 30 pounds with LED lights. And according to one holiday calculator, it would cost about $6-10 per season to light your tree with three strands of incandescents versus only 13-17 cents with LEDs. Convinced you’ll make the switch? Holidayleds.com will recycle your incandescent lights for you. Mail them in and the company recycles the lights and the box they were shipped in, and they will send you a coupon for 15 percent off LED light purchases through its site. You can save even more and use those new LED lights on a timer! Alright, so you have a trophy to prove you were the competitive eating champion in 1988 and the karaoke champion in 1990, but those glory days are long gone. The trophies now collect dust in a box in the garage. And unless another talented competitive eater with the same name is about to take the title, your trophy may have little reuse value. Total Awards & Promotions, Inc. has created a trophy recycling program to benefit charities. Through a mail-in program, the company’s Madison, Wisc. headquarters recycles your defunct awards or re-engraves and donates them to nonprofit organizations. One of many trophy recycling programs offered nationwide, the company also manufacturers its own awards made of recycled glass and newsprint. As technology evolves, we’re left with souvenirs in the form of CDs/DVDs, cassette and video tapes and floppy disks. This author admits to having an entire box of 80s cassette tapes in her garage! While you would think this stuff would be considered electronic waste, the fact that it doesn’t contain metals or a power cord disqualifies it from that category. But that doesn’t mean these products aren’t recyclable. Best Buy collects CDs and DVDs for recycling at in-store kiosks. Another option is the Green Disk mail-in program, which recycles media into new CDs and disks. Green Disk also collects cases for recycling, so you won’t be left with a bunch of plastic lying around.